The scrubs are not much better than my own nursing school! I wanted to share with you how I became a certified nursing assistant in high school. I was blessed to have a high school that worked with a program to provide students with technical education programs. It has been awhile since I took the class, almost 4 years, but I think it was like 2-3 days a week after my high school classes for 3-4 hours. We had both skills and knowledge exams. In addition we had a set amount of clinical hours that we had to complete. 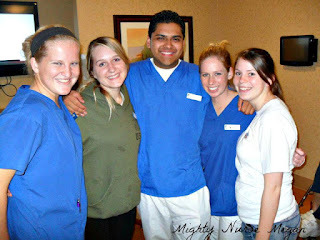 My clinical was completed at a local nursing rehabilitation home. My clinical hours were really enjoyable. Although a lot of my CNA work dealt with bodily functions, I learned to still provide dignity for my patients. I also made real connections with patients; Elderly women were the chattiest and really tried to set me up with their grand kids. Some basic CNA skills include taking and recording vital signs, transferring patients, infection control, assisting patients with personal hygiene, and peri care. After completing my course and required clinical hours, I had to pass a state board exam. The exam has both practical and clinical components. I remember having to preform proper hand washing, positioning of my patient, and making an occupied bed. I was nervous, but passed on my first try! I have to do some continual education units every two years for renewal. 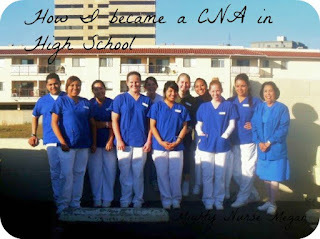 I think having my CNA license has set me apart from my other classmates. I had the advantage of already being in a clinical setting. I also had some very basic nursing skills like vital signs, bed pans, and how to properly transfer patients. This really helped when we started learning skills my sophomore year of nursing. And I have been able to continue using my skills by being able to apply to and work CNA jobs instead of tech positions throughout the year. I hope this was helpful and if you have any questions about my journey or want more specifics, then leave a comment down below.